One of my favourite events in the lead up to Christmas has got to be decorating the Christmas tree. Christmas shopping can prove stressful (although much easier online! ), coordinating relatives can be tricky, and planning food can be a nightmare, but decking out the Christmas Tree with my favourite Christmas decorations has always been a real treat for me. However Christmas Trees do come with a certain dilemma. Some people prefer fake Christmas trees, and although I’ve got no time for them, I guess it must be convenient that all you have to do is get it down from the loft or out of the cupboard… I much prefer real Christmas trees – after all there’s nothing that smells quite like Christmas like the scent of fresh pine needles. This year, we’re delighted to have come across a Christmas tree which suits both parties, and even better – they’re fair trade! Fair Trees Christmas Trees are delivered right to you door, so there can be no argument from those who prefer the ‘convenince’ of the tree up in your loft, and they’re approved by Fair Trade Denmark, which promotes ecology and sustainable form of production too. 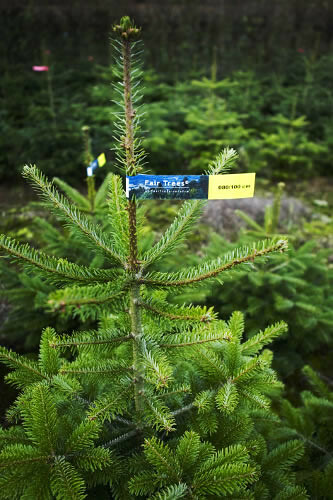 These fair trade Christmas trees are genuine Nordmann Fir trees, grown using only the best ethically sourced seeds. They retain their needles very well (which busts the other argument from the fake tree enthusiasts! ), and the workers that grow the trees are paid a fair wage, and supported in health care and education.